Everyone keeps saying how insane Playhouse is and that it’s one of the top clubs in Hollywood, so obviously we had to go. One of my coworkers is quite fond of the place, so I went with somewhat high expectations. Fortunately my group was hooked up through a promoter who put us on his VIP list. Not shabby at all. The night of Cinco De Mayo, The Everything Nice Girls and I arrive at the venue and there is a long line. Naturally we head straight the front of the line to talk to one of the promoters. We do our essential name drop to get inside and the guy looks at us and chuckles. He tells us to stand in line and that he’ll come get us. We get in line and a minute later he comes up to us. He informs us that he can get the girls in free, but that I will have to pay $20. Now anyone who knows me knows I despise cover charges, especially if the place isn’t worth it. So I don’t. The girls get wristbands and I text our promoter friend. We get to the front of the line and the girls get inside. Luckily our friend texts me back and lets me know I need to find his friend who will mark me off the VIP list. I find the other promoter and he lets everyone know that I don’t need to pay. Sweet. I catch up with the girls, who all hit the ladies room, and we head into the club. Playhouse has two floors, though you would not notice from first glance. When you walk in, you’ll see the restrooms to your right, then you enter the club itself. On the main floor there are two main bars. One to your right, which is at one end of the club, and one bar in the middle. 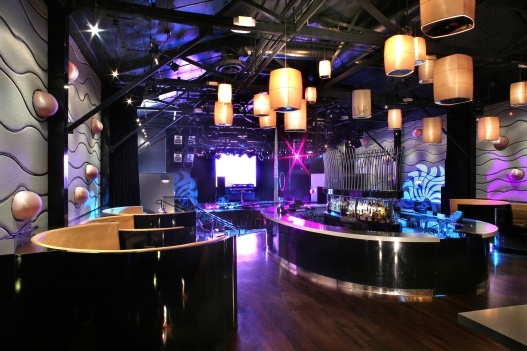 Along the sides of the club there are a tables for bottle service with a DJ and dance floor on the opposite end of the clubs. I hit the middle bar and the girls decide to hit the dance floor while I chat up one of the bartenders. Moments later the girls circle back towards the bar and I buy them drinks. I guess I made a good impression with the bartender because she gave us free shots as well. Nice. I close out my tab and realize that each drink ran about $11 to $12. Ridiculous, even by Hollywood’s standards. I shrug as I remember that I’ve blown a LOT more money on a given night buying women drinks. At least present company consisted of friends. Eventually after a round or two, we hit an incredibly packed dance floor. From all the hype, I expected a massive dance floor. In fact the dance floor is a small percentage of the actual club. Also the it isn’t on the same level as the rest of the club, but a few feet lower than everything else. This means that you have to go up and down a few steps to get in and out of the dance floor, hence the cramping. In front of the dance floor (which is also on the other side of the club) there is a DJ, which a large screen behind him. At the time the screen only had dancing light….seems like a waste of a screen. Playhouse could benefit from a sick Video DJ like Jimmy G in my opinion. We ascend the stairs back to the bar. At this point there are far more people in the club. At this point one of the bouncers points out that there is a second floor. Cool. So we head upstairs and find ourselves in more of a lounge type setting with more tables and elbow room. Though I didn’t care to get a drink up here, I did appreciate the amount of space. A few of sat on the lounge couches while Ms. Craig got hit on by a few wasted losers. Eventually we went back downstairs to the dance floor. We did see a live show that night from a new up and coming group, My Hero. You can hear the song they performed at Sneak’s VIP. The performance was pretty cool. Afterward go-go dancers started dancing next to the bouncer and on top of he middle bar. That was pretty much it. Eventually we all decided to call it a night, even though the club was still going. Apparently the Playhouse stays open until 4am. It wasn’t bad, may come back to this one.